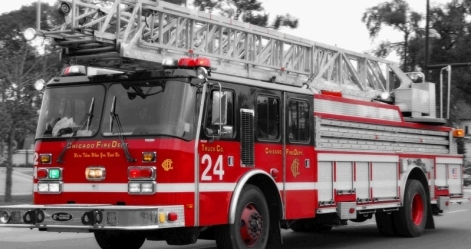 The Chicago Fire Department is the third largest municipal fire department in the United States, and receives over 500,000 emergency calls annually. There are four Bureaus of Operation within the Chicago Fire Department: Operations, Administrative Services, Logistics and Fire Prevention. The Bureau of Operations is the largest Bureau within the Chicago Fire Department. The Bureau of Operations commands the following Divisions: Fire Suppression & Rescue, Emergency Medical Services (EMS), Special Operations, and the Office of Fire Investigation (OFI). The Bureau of Operations is composed of over 4,500 Firefighters and Paramedics and is commanded by a Deputy Fire Commissioner. Help Needed If you are a firefighter in the CFD, we need your help to verify the station information shown below is current and correct. Chicago was nothing more than a little frontier village during its beginning days with roughly six frame buildings and a population estimated at one hundred and fifty. The first building erected in 1831 was a tavern. Mark Beaubien was the proprietor and he named his establishment the "Sauganash Tavern". Most dwellers lived along the south bank of the Chicago River on South Water Street. The city boundaries were Ohio Street on the north, Jefferson on the west, Jackson on the south and on the east it was State Street south of the river; Lake Michigan north of the river. The Sauganash Tavern remained the social center of Chicago until March of 1851, at which time a fire caused its closure. The first Fire Company was formed in 1832 called the "Washington Volunteers". The first Chicago ordinance was passed November of 1833, prohibiting " the passing of any stove pipe through the roof, partition or siding of any building, unless guarded by tin or iron six inches from the wood". The penalty charge for this infringement was $5.00. Coincidently, if the violation wasn't corrected within 48 hours the penalty was repeated. As a result of this ordinance the first Fire Warden named Benjamin Jones was appointed. In September of 1834, Chicago was divided into four wards – a Fire Warden for each. The fire Warden was paid to make monthly inspections to verify compliance, particularly of the stovepipe ordinance. During October of 1834, an individual carrying a shovel of hot coal embers from one building to the next at Lake and LaSalle Street accidentally initiated a fire. The following day an article was printed in the Chicago Democrat Newspaper criticizing the city for its lack of competent authority at the fire. Consequently, another ordinance was immediately enacted indicating the Warden presiding in the district of the fire occurrence acts as the Chief in command; the remaining ward Wardens as his assistants. Additionally, a Warden had the jurisdiction to insist bystanders participate in the extinguishment of the fire and if met with opposition a fine of $5.00 was imposed. In November 1835 yet another ordinance was created, however this one was two fold, a storeowner or dwelling occupant was ordered to provide one leather fire water bucket for each fireplace or stove in the building and hung in a conspicuous place. Hence if more than one fireplace or stove – that many fire water buckets were expected. Furthermore, the second part to this ordinance was a directive commanding owners and dwellers to go promptly to the scene of a fire with their very own personal fire water bucket, which was identified by the painting of their initials thereon. Of course, a fine was levied for negligence of the bucket ordinance and/or unwillingness to participate at the fire scene. As a direct result of the fire water bucket ordinance the first fire bucket brigade was formed in November of 1835 called "Fire Guards Bucket Company". Pioneer Hook and Ladder Company No. 1 was organized a month earlier on October 7. Earlier than that even, September the Board of Trustees convinced the town president to place an order for two hand pump fire engines and one thousand feet of hose. A month later additional equipment was ordered: two ladders-sixteen feet long, two fire hooks with chain and rope, four axes, and four handsaws. The town census of 1835 showed a population of 3,265. The rapid building of Chicago was done almost entirely of combustible material. The town trustees were stirred to improve the Fire Department. Hirman Hugunin, president of the board of trustees, became the Chief Engineer of the Fire Department in December of 1835. The first site for Engine Company No. 1,"Fire King" was LaSalle Street where City Hall is now. The dimension of the house was twenty-four by twelve feet in size. With much inducing by the members "to place a cistern in the building to hold two hogshead of water, (63 gallons per hogshead) and to be made of good pine lumber" the board of trustees agreed. The November ordinance of 1835 insisted on a Chief Engineer, two assistants, and four Fire Wardens (in addition to the board trustees who were Fire Wardens-ex-officio). This same ordinance empowered the trustees to appoint the members of the department. George E. Snow succeeded Chief Hugunin and became the second Chief of the Fire Department on February 17, 1836. Chosen by a special committee of firefighters and approved by the board of trustees, John M. Turner was appointed Chief Engineer in February 1837. He was foreman of Hook and Ladder Company No. 1 and Alvin Calhoun was elected foreman of Engine Company No. 1. On March 4, 1837 Chicago was incorporated as a City. According to a special census 4,170 was the population at that time. The City under the first charter was divided into six wards. Fire Wardens were members of the City council with power to appoint others and to organize fire companies. A Chief Engineer and two assistants were to be elected annually by the voters of the city. If the voters failed to do so the council appointed the Chief and his assistants. A new second Engine was purchased in the fall of 1837 with the formation of the "Tradesman's Fire Company" in December. The name soon changed to the "Metamora Engine Company No. 2" located on Lake Street east of the river. In 1839 Alexander Lloyd was chosen Chief and held the office for one year. Alvin Calhoun was the fifth Chief of the Fire Department, serving from 1839 to 1840. The first fire of any significance occurred October 27, 1839 on Lake Street near Dearborn. 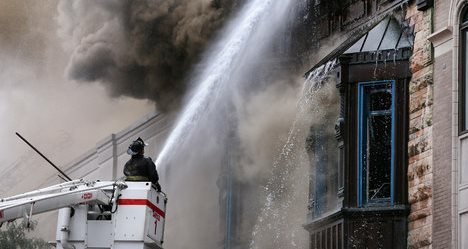 The fire destroyed the Tremont House and 17 other structures, as well, with damages amounting to $65,000.00. September of 1841, the "Chicago Bag and Fire Guard Company" better known as "The Forty Thieves" was formed. This company fought fires with canvas bags, cords and wrenches protecting life and property for five years. The "Citizens Fire Brigade of Chicago" was patterned after "The Forty Thieves" company following the disastrous fire of October 19, 1857 in which twenty-three people perished and the property damage neared $500,000.00. During the next decade the Chicago Fire Department added to its volunteer companies a total of two-bucket companies, three engine companies, and two hose companies. These companies held names such as "The Rough and Ready Bucket Company No. 1", "Red Jackets Engine Company No. 4", "Neptune" and "Hope Hose Company No. 2" which was the last of the volunteer companies. The "Hope" Hose Company No. 2 was formed in March of 1848. This company was notorious because of its one minute and seven second run of five hundred yards with three hundred feet of hose and its connection to the water source. Hope Company had a remarkable career of service until disbanded in 1859. February 14, 1851 marked the second charter for the City. It was decided voters of the city would elect a Chief Engineer and one First Assistant Engineer annually. Also, council would appoint as many Fire Wardens and Firemen as deemed necessary for the city's safety. The city was divided again with an additional two wards, a total of nine. The city limits were extended August 1, 1850, to include the district east of Chicago River south and west of State-north of the alley running between Randolph and Washington. Engine Company No. 7, "Lawrence" was organized in September 1850 but reorganized as the "Eagle" in 1852. "Lone Star" Hose Company No. 3 was established in September of 1851 and afterwards became the "Illinois" in October of 1853. The "Phoenix" Engine Company No. 8 was brought to life in December of 1851 only to be changed to "Cataract" in October 1853. The members of the "Phoenix" were mostly sailors and could not be depended upon during navigation season. The next increase to the fire force wasn't until February 1854; "New England" later known as the "America" Company No. 9 was created. "In 1845, when I first joined, the department had no water works and we had to depend on the river for suction. We had a sewer running down Madison Street to State and down State to the river. The sewer connected with LaSalle, Clark, and Dearborn. That was our principal reliance for water, except for river, when it was too far away. No. 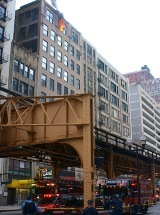 5, the Company I helped to organize lay on Randolph Street, on the west side of the Bridge. It was a two-story frame house with a meeting room upstairs. In the evenings, we used to gather around there, like at all engine houses, waiting for a fire. They were all strapping young fellows; but there are some who are now, like myself, old heads living still." 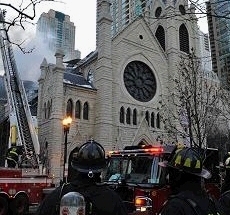 "In our time, we had the Unitarian Church bell to sound the alarm, on Washington and Dearborn. We had some arrangements made with the sexton to ring the alarm. That was before the courthouse was built." "In 1855, ‘56, ‘57, they got up other alarm bells. One of these was located on the corner of Fourth Avenue and Twelfth Street. These were small bells. Some of these bells are in use today, having escaped the big fire." "In 1855, when we first started in to agitate getting steam engines, the mayor appointed a committee to visit Cincinnati to test and see what the steam engines could do. Being Chief of the department, I was one of the committee. We went down there and they got out their engines. But it was bad for them; they blew the steam chest off and killed the engineer, which put a damper on buying steam engines for the time. There was nothing done then for two years, when the council ordered the "Long John". We had engines sent to Chicago before that, but they didn't suit us, as they were too heavy and didn't answer the purpose. The "Long John" was made to order in Seneca Falls, N.Y. and sent on. We had her stored then in James Howe's livery stable, on Randolph Street, near the Sherman House. We had an engineer and Mr. King's four-horse team was kept in the stable, in case we wanted to turn out. The driver was paid only when called on.The engineer was paid a regular salary." In February of 1855, a deep toned bell was installed in the new courthouse. The July of 1855 ordinance passed, dividing the City into six fire districts. An alarm sounding code was initiated-eight strokes of the fire bell signaled the alarm; the additional strokes indicated the district. A watchman was continually on duty in the tower. Other than to ring the bell the watchman was responsible to hand out flags by day and lanterns by night, used to direct firefighters to the scene of the fire. In those days there was no gas, so to light the way-torch boys ran ahead of the engine. When an alarm was rung at night, citizens were responsible to place lighted candles in their windows, lighting the way for the firefighters. The "Long John" steam fire engine tested in February 1858 was met with hostility from the volunteer firemen. The volunteers could sense this was the beginning of their extinction. The steam engine "Long John" was put into service on May 1, 1858 at the corner of Adams and Franklin Street. Firefighters of the volunteer hose companies and two paid members, the engineer and assistant engineer manned the "Long John". The death bell of the volunteer fire department was rung on August 2, 1858, when city council passed the ordinance organizing the paid City of Chicago Fire Department. The first completely paid company was Engine Company No. 3, located at 225 South Michigan Street. This company was one of fifteen engines and three hook and ladder companies acquired from the volunteer department. The entire inventory for Chicago's Fire Department year 1866 was: eleven steamers, two hand engines, thirteen hose carts, one hook and ladder truck, 120 paid members, 125 volunteers and 53 horses. The annual report for the year ending April 1, 1867 called attention to services rendered by the few canvases, otherwise known tarpaulins, placed in service sometime during that year. The focus was drawn because a fire broke out at Lake and Clark Street and this particular material saved $25,000.00 worth of chattels on the very eve of the day it was distributed. The Sanitary Department reported in 1870 the total number of buildings within the City limits to be: 48,867 of brick construction, 44,274 of wood and 914 of stone or iron. It was reported the fire department averaged about two fires a day. This same year the "Knocke-Pattent Hose Elevator" was introduced into the fire department as the first water tower of its kind. It ran out of quarters located at Washington and Franklin Street as Hose Elevator No. 2. This apparatus came equipped with an elevating platform on which a firefighter was positioned to aim a hose stream; the hose line elevated with the platform as it was raised. In 1871 Hose Elevator No. 1 designed by Skinner was put into service. Skinner also made a similar model for St. Louis Fire Department. The summer of 1871 marked a fourteen-week drought. Beginning with the devastating "Burlington Warehouse" fire of September 30, the fire department was taxed daily. Twenty fires in one week, three on October 4, four on October 5, and five on October 6; the hastily wood constructed Chicago in a most precarious fate. An alarm sounded some time between ten and eleven on October 7, for 209 South Canal Street. 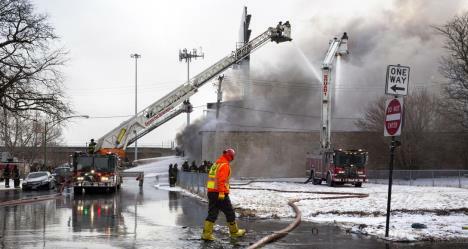 A fire raged in the boiler room of the Lull-Holmes Planeing Mill and upon arrival of the firefighters the entire mill and its contents were consumed. Due to the strong southerly winds the fires wrath was out of control. The greater portion of the block was littered with lumber sheds, outbuildings, and dwellings. Within twenty minutes of the fires discovery, the entire area from Jackson, Adams, Clinton Street and the River was ablaze. Even though the firefighters were totally exhausted they fought unceasingly, eventually succeeding in preventing the fire from crossing Adams to the north. Too short of recovery time to put the apparatus back in service and insufficient rest left the firefighters thoroughly spent for what they were to encounter in just a few hours. "It was like a snowstorm only the flakes were red instead of white", wrote Bessie Bradwell Helmer. The Great Chicago Fire began around nine o'clock on Sunday evening, October 8, 1871. The fire driven by a strong wind out the southwest headed straight for the City's center. A.T. Andreas, the city's noted nineteenth-century historian wrote, "Nature had withheld her accustomed measure of prevention, and man had added to the peril by recklessness". Approximately, around midnight the flaming brands and the superheated draft it generated leaped to the south branch of the Chicago River. It seemed as if the ground itself had ignited, which in fact it may well have considering the streets, sidewalks, and bridges were made of wood. Even the Chicago River was vulnerable, as many vessels and the grease along the water's surface were ablaze. The Courthouse tower watchman barely escaped the flames by sliding down the banister at one-thirty in the morning of the tenth. Thousands fled the North Division, and by three a.m. the Rumsey House on Huron was consumed, along with the roof on the pumping station collapsing, rendering any firefighting efforts useless. Back in the South Division, the luxurious new Palmer House gave way, including the offices of the Chicago Tribune, whose editors all summer long urged the Common Council to increase the level of fire protection if they intended to prevent such a disaster. Terrace Row was one of the last South Division structures to fall. 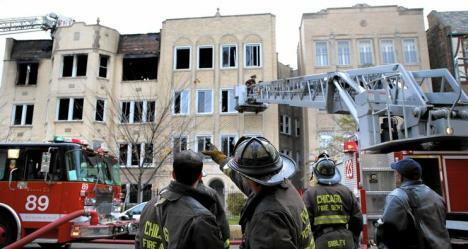 On Monday North Division fires had advanced to then city limits, Fullerton Avenue. 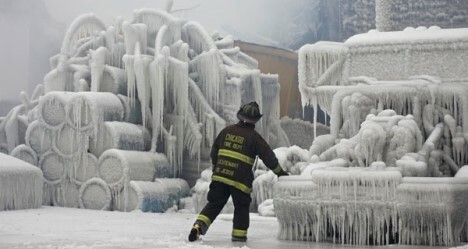 A salvation rain fell on Tuesday, the flames finally smothered, surrendering Chicago a burnt, smoking, steaming wreck. Chicago remained extremely hot—it took two days before any survey of the damage was feasible. It was documented that important contents of safes burst into flames upon opening, just from the introduction of oxygen. "No city can equal now the ruins of Chicago, not even Pompeii, much less Paris," E.J. Goodspeed bragged in his history of the fire. "Here all time is reproduced in a moment," he writes, forgetting it was the haste of the city's growth that put its future at risk in the first place. A map appeared in all accounts of the fire titled the "Burnt District", portraying an area four miles long, three quarters of a mile wide—more than two thousand acres—of which twenty-eight miles were streets, one hundred twenty miles of sidewalk, over two thousand lampposts, countless trees, shrubs and flowering pots. Eighteen thousand buildings were destroyed and nearly two hundred million dollars in property-about a third of the city's value demolished. A total of one hundred thousand Chicagoans lost their homes. The total fatalities estimated between two hundred and three hundred. The hardest hit was the North Division; thirteen thousand three hundred of the thirteen thousand eight hundred structures were reduced to rubble, the majority of area residents-seventy five thousand people without a home. The Fire Department was shamefully inadequate. The minimal provisions invited disaster. The city was crippled, seventeen engines (one disabled in the October 7th fire and two in the repair shop) and only two hundred sixteen firemen available. The city was in need of desperate alterations and additions. The city purchased three tugboats and fortified them with fire appliances. These make shift fireboats were operated by detailed firemen. "Geyser" was the first fireboat constructed and was launched on July 29,1886. "Yosemite" was christened on May 31, 1890. "Fire Queen" was completed in time for the 1893 World's Fair and the "Illinois"; a steel fireboat was launched on January 14, 1899 and later became Engine 37. Captain David Kenyon invented the first sliding pole in 1878. The pole was placed in the quarters of Engine 21, located at 313 Third Avenue (909 South Plymouth Court). Captain Kenyon was a member of the volunteer fire department from 1856 to 1859. He became a paid member in 1869, assigned to Engine 5. The "joker" a telegraph system was introduced and installed on May 9th of 1878. It was similar to the "Barret" system employed by the Fire Insurance Patrol. In 1883, a "Hayes Patent Turntable" was added to the department. It was delivered to the quarters of Hook and Ladder No. 1. This particular apparatus was especially adapted to reach upper portions of tall buildings. In 1884 two more of these patented turntables hook and ladder trucks with fire escapes complemented the fire department. Through the donations of Carter H. Harrison and Lambert Tree, in 1885 a fund was initiated to provide a gold medal for the members of the fire department who distinguished themselves by acts of bravery in the saving of lives and property. In November of 1885, council passed a new city ordinance. It stated, each year a record known as the "Merit Roll" was to be kept at headquarters-listing the acts of bravery and heroism by members of the department. This roll served as a basis for the trustees to choose a winner. In 1886, Third Battalion Chief Petri, assigned to the repair shop, manufactured a water tower. It was built under the direction of Shop Foreman Ashworth and put into service at the old armory structure at Adams Street. During the first year of service the water tower responded to 100 alarms, traveled 95 miles and worked 16 hours. Later, "Champion Tower" was bought and placed in service as Tower 2 at Engine 5's quarters, located at what is now 326 South Jefferson Street. The largest annexation to the City of Chicago, took place in 1889. This included the districts of: Hyde Park, Lake, Lake View, Jefferson, Cicero, Roseland, Irving Park, Bowmansville and Riverdale. Until this time volunteers manned the five districts, they then received recognition by the City ofChicago Fire Department and were incorporated. The apparatus inventory for Chicago Fire Department in 1900 included: five fireboats, two water towers, 101 steam engines, four hand engines, 27 chemical engines, 85 hose carts, carriages and wagons, 34 hook and ladder trucks, 23 chemical extinguishers and 102 portable pumps. The brigade was composed of 17 battalions with a uniform force of 1,142 firemen and a non-uniformed force. The city telegraph corps was forty-two strong. The total number of horses was 503. A fire broke out on stage during a matinee performance of "Bluebeard" at the Iroquois Theater on December 31, 1903. Within two minutes after the alarm was received the Fire Department was on the scene, rescuing 104 people. Dreadfully, 602 individuals lost their life, most of them to the toxic fumes and smoke. The fire itself was extinguished within thirty minutes holding the building damage to a minimum. Michael J. Corrigan of Engine 13 was one of the first on the scene; he later became the Fire Commissioner. James Horan became the appointed Fire Marshal in 1906. He immediately began to renovate the Fire Department. Between 1906 and 1910 many new firehouses were built and Engine 101 through 117; truck 30 through 34 were organized. Horribly, however a wall fell on Chief Horan and twenty-eight firefighters, killing them all. It was December 22, 1910; it was the Great Stockyard Fire at the Armor and Company Plant, a 4-11 with 5 specials. No other fire had such a savage toll on life. In 1912, a 650-gallon per minute rotary pumper built by Webb Motor Company, was purchased and put into service. It was assigned to Engine 102's quarters located at 7075 North Clark Street in the Rogers Park Town Hall. This was the beginning of the end for the horse drawn apparatus. Even though there was much trepidation and sabotaging, February 5, 1923 marked the last fire call at Ontario and State for the horse-drawn apparatus. After 65 years, the horse drawn era was over. 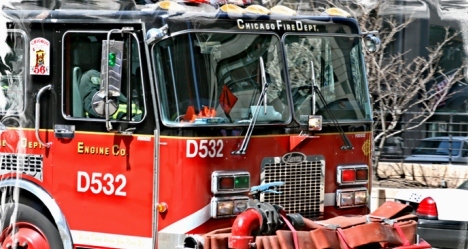 Chicago became the first major city in the nation to completely motorize its Fire Department. The mid-1920s' saw Arthur Seyferlich and Edward Buckley serve as Fire Marshals, and Joseph Connery as Fire Commissioner. In 1927, the Fire Department put it all together, and the modern department, as we know it emerged. It started with the appointment of Albert Goodrich as Fire Commissioner and Michael J. Corrigan as Chief Fire Marshal. The instruction, training and standardization of hose and ladder work, as taught in the Drill School, started to pay off. The fire apparatus was all new, well designed and efficient. To service this equipment, the Fire Department since 1923 was operating its own Repair Shop at 31st & Sacramento in a former city facility. Beside automotive repair, the "Shops" comprise a foundry, paint spray booth, ladder and hose repair shops, and a warehouse stocked with hundreds of everyday items. Many new companies were organized, apparatus and equipment purchased, 20 new fire stations built, and manpower added. In a two—year period, September 1927 to December 1929, 14 hook and ladders (trucks 39 through 52) were organized. Special apparatus were placed in service: 6 ambulances, 4 foamite and chemical rigs, 3 floodlights wagons, 3 rescue companies, and air compressor and a smoke ejector. Fire Commissioner Goodrich's family also owned a steamship line. He was well aware of the required red and green lights on ships identifying their port & starboard sides, allowing for safe passing during inclement weather. The red and green lights were installed on fire apparatus and stations based upon this nautical theme. The City purchased 28 Model "A" Fords for their Battalion Chiefs. The roofs of the cars were a tar composition that could not be painted and were left black while the bottoms were painted red. This color scheme has prevailed till today. The intertwined CFD logo was adopted during this period. Administratively, the department was divided into 6 divisions and 28 battalions. A band and a baseball team, which played other major fire department teams, were formed. The prosperous twenties were followed by the depression in the thirties Chicago was broke and the Fire Department reflected this by disbanding fire companies, closing fire stations, and reducing hiring and purchases. As the financial picture brightened in the mid-thirties, apparatus purchases and building resumed. In 1936, the last of the wood firehouses were replaced as 11 modern fire stations were built, with the help of the Federal Government through the W.P.A. The year 1938 saw the purchase of modern sedan pumpers, truck tractors, and the first of the popular annual "Police & Fire Thrill Shows" held at Soldier Field, from 1938 until war was declared in 1941. The shows were reinstituted after the war. Two noteworthy fires occurred in the thirties: the 1934 Stockyards fire, which for a time threatened the entire city and caused 8 million dollars damage, and the spectacular 1939 Rosenbaum elevator fire at 102nd and the Calumet River. Firefighters, who without any mechanical breathing apparatus would walk into any burning structure without concern for their individual health or their ability to breath in dense unrelenting smoke, earned the title of "Iron Lungs". The thirties saw legislation mandating compulsory retirement at age 63, and the granting of additional time off through a "Kelly Day," named for the mayor. A major improvement in communications was achieved with the installation of loudspeakers, or amplifiers in all the fire stations. Now the Fire Alarm Office could instantly dispatch specific units to fires and special duties, giving the exact address and the nature or type of incident. The forties had just begun when World War II started. Eventually some 516 Chicago Firemen would enter the military with 7 making the supreme sacrifice. In 1942, Anthony J. Mullaney was promoted to Chief Fire Marshal, a post vacant since 1937, when Michael J. Corrigan became Fire Commissioner. Fires with tragic loss of life and injuries occurred in 1940, when 5 firemen were killed in an explosion at Henderson & Kimball, and 1943, when 8 firemen died in a building collapse at 419 W. Superior St. The end of World War II in August 1945 saw the return of former firemen (veterans) and the hiring of service veterans who turned to the Fire Department for job security. One returning fireman, Joseph McCarthy of Truck 11 who won the Congressional Medal of Honor in the Pacific, came home to reorganize the Ambulance Service. Starting with a handful of men and 4 war-time ambulances, he built up the largest Fire Department Ambulance Service in the country. The 1950's saw the Fire Department embark on a major program to replace its aging fleet of apparatus. Between 1949 and 1956, the department purchased 122 engines, 37 hook & ladders, 14 squads and 2 fireboats. Call letters "KSC 711" were first heard in June 1952, when the Fire Department radio network became operational. The original system had only one citywide frequency and no radio repeater. Between 1951 and 1957, Jeremiah McAuliffe, John Haberkorn and Albert H. Petersen served as Chief Fire Marshals. A remarkable career ended in March 1955, when Fire Commissioner Michael J. Corrigan stepped down after 62 years of active service. His proudest boast was that in all those years he never had a fireman killed when he was in command. The year 1955 also saw the introduction of the third platoon (24 hours on duty, 48 hours off) and with the promotion to Assistant Fire Commissioner of Robert Quinn. In March 1957, Robert J. Quinn was appointed Fire Commissioner, replacing Anthony J. Mulleny. Immediate changes were evident. Innovation was seen in all branches of the department. Improvements in communication included the installation of radios in all fire apparatus, completed in 1957. This was a great improvement as it enabled the fire alarm office to dispatch companies from one assignment to another, and allowed the fire companies to leave their stations to inspect buildings, drill, replenish fuel and supplies, yet stay in service via radio. New types of fire apparatus were introduced. 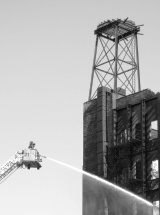 The snorkel in 1958 revolutionized urban fire fighting with its highly flexible approach to buildings and locations. Fire engines were purchased with booster tanks carrying up to 500 gallons of water. New concepts like the "Snorkel Squad", deluge units known as "Big Mo" and "Big John" were introduced. The old Drill School was replaced in 1961 by the modern Fire Academy where instruction and applied practical knowledge are taught to rookies and veterans alike. This modern era introduced new bureaus and services. Air Sea Rescue utilized helicopters and boats, manned by firefighter pilots and scuba divers using emerging changes in equipment, and applied them to Life Safety. The Photography Section and the Bureau of Fire Investigation were formed. The Fire Prevention Bureau increased Building Inspections and Education. 911, a new emergency phone number to call fire, police and ambulance service, was inaugurated in September, 1976. The Emergency Medical Service (EMS) grew from 16 Cadillac ambulances in 1957 to 43 modern modular vans by 1977. 1974 saw the introduction of both male and female paramedics. Firefighters formed the glee club, marching team and intramural sports were encouraged, particularly handball, all aimed at promoting physical fitness and teamwork. Big fires included the Our Lady of the Angels school fire in 1958; the Hubbard Street fire in 1961 in which 9 firefighters died; the McCormick Place fire in 1967, a 54 million dollar loss; the blizzard of 1967; and the West Side riots in 1968. Changes in more than equipment were evident. Quinn was a builder. In two decades Commissioner Quinn built 36 new stations which were larger and better located, providing a better environment; several major additions to existing stations; and the new Fire Academy, a modern state-of-art training facility. In 1978, Robert J. Quinn retired with his service spanning 49 years plus, including 21 years as Commissioner. His successor was Deputy Commissioner Richard Albrecht, who initiated changes in communications. In 1978, construction began on a Computer Aided Dispatch Center (CAD), and an Ambulance Dispatch Center (ADC). The third cold bitter winter in a row was intensified by the blizzard of January 1979. Streets were clogged by ice and snow; consequently stalled vehicles delayed response, which caused the department to sound 45 extra alarms in one month, 6 in one day – January 15th, both records. Two major transportation accidents occurred during this period. On February 4, 1977, and "L" train accident and derailment at Lake and Wabash caused 16 deaths and injured 152. A major air disaster occurred May 25, 1979, when Flight 191 crashed on take-off killing all 272 on board. In April 1980, Commissioner Albrecht re-structured the department into 5 Districts, with a district chief directing all 3 platoons. In August 1980, Albrecht was replaced by Acting Fire Commissioner Charles Pierce. The year 1980 also brought the first firefighter strike in the history of the department. Starting on February 14th the strike lasted 23 days with negotiations toward a contract culminating in early 1982. William Blair, a Fire chief from Los Angels, California, was appointed Fire Commissioner in September 1980, succeeding Chief Pierce. Commissioner Blair began his tenure with the largest re-organization in the Chicago Fire Department history, with literally hundreds of men receiving new assignments. The largest number of promotions and transfers were initiated to maintain and staff the Department. All fire companies were issued portable radios, a big step in communications, fire control and safety. In September 1982, the Fire Department was re-organized into 6 Districts and 24 Battalions to equalize the administrative workload. Training emphasis were placed on fighting high-rise fires and establishing Incident Command Procedures. During Commissioner Blair's tenure, cold winters prevailed and on January 10, 1982, when the mercury plunged to a record breaking –26 F., major fires occurred at Wells and Scott Street; the Washtenaw and Bloomingdale fire, which destroyed 14 buildings; and the 700 block of Junior Terrace. Freezing-up conditions existed requiring a superhuman effort by all members in their response to fire after fire, a performance in keeping with the highest traditions in the department. In August 1983, Louis T. Galante was appointed Fire Commissioner, replacing William R. Blair. Changes and improvements occurred in many areas, starting with a pilot program to test theory with practice. In fire fighting, "Quick Water" was adopted, that is, attacking a fire immediately, using the water from the engine's 500 gallon water tank through pre-connected hose lines, or the fixed deck gun. New "Search and Rescue" guidelines were issued to hook & ladder companies. The Emergency Medical Service experienced tremendous growth in the number of calls and services provided. In order to speed response time to these types of emergency requests, an "Ambulance Assist" program was developed in which all Fire Companies were trained to provide basic emergency medical services. As a condition of this program, all apparatus were equipped with resuscitator and first aid equipment, to respond to E.M.S. calls as part of this program, whenever an ambulance was not locally available. 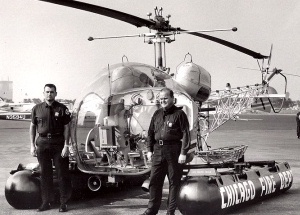 Five more ambulance companies were organized, 4 on May 15, 1987, bringing the total units in service to 54. In 1984, the new Computer Aided Dispatch Center (CAD) was activated for one year with disappointing results and was abandoned. Fire and ambulance dispatching returned to the Main and Englewood Fire Alarm Offices. A four door sedan cab became the new standard for engine purchases to protect firefighter in transit. A Hazardous Incident Team (HIT), which specialized in mitigating and containing hazardous and toxic materials was organized. As a means to alert and protect and public from smoke and fire, a smoke detector ordinance was passed for all homes and apartment buildings. "Smoke Detectors Save Lives" became the slogan. On May 10, 1989, Raymond E. Orozco was appointed as Fire Commissioner, succeeding Louis Galante. A number of new projects were placed in service. The Public Education Section of the Fire Prevention Bureau opened a "Survive Alive Center" during Fire Prevention Week, 1990, consisting of a two bedroom house in which school children are taught how to survive a fire in their home. The "Survive Alive Center" has only one goal:" To decrease the number of children who die or are injured in fires." A second project was the placing in service of a State-Of-The-Art Hazardous Material Van. Additionally, 3 ambulance companies were organized, bringing the total to 57. In March 1991, a dual purpose fire station was placed in service at Midway Airport, containing 8 apparatus bays, providing service to the community and the airport. In 1990, Commissioner Orozco was instrumental in the purchase of fifty-four (54) new ambulances, 1 hazardous material truck, and 3 new command vans, and in 1991, 30 new buggies were put in service. On January 17, 1992, 71 pieces of fire fighting equipment were used to extinguish 37 structure fires caused by a natural gas leak in the River North section of the city. There were 4 fatalities and 5 injuries. On Monday, April 13, 1992, flooding in the old Chicago tunnel system was discovered, when buildings throughout the Loop began taking on excessive amounts of water. Two large whirlpools were sighted in the river, near a cluster of pilings at the Kinzie St. bridge, and fish were discovered in the flooded basements indicating a breach in the old Chicago Tunnel wall at this location. By 11 a.m., an evacuation plan was executed by Commissioner Orozco, and by 2 p.m., the entire Loop, except for emergency workers, had been evacuated (estimated at close to a million people). The Fire Department's Emergency Preparedness Disaster Plan was put into effect. 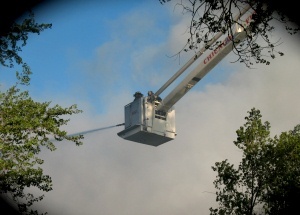 Suburban fire departments were brought in via our mutual aid response system to assist in manning pumps and generators. The Army Corps of Engineers was called in, and systematically lowered the Chicago River, relieving the water flow into the flooded basements. On April 15, 1992, President George Bush declared a major disaster due to the flooding in Chicago. By April 28 1992, Kenny Brothers Construction had sealed the leak. The City of Chicago underwent the task of cleaning up from what would thereafter be known as "The Great Chicago Flood." In 1992, 17 new pumpers and 18 new buggies were placed in service under Commissioner Orozco. On December 16 1995, the department issued Personal Alert Safety Systems (PASS alarms) to all members in Fire Suppression & Rescue. This device would emit an audible and visual alarm should a member become motionless for 30 seconds. The purpose being to locate and rescue injured or trapped firefighters. The PASS alarms were originally attached to firefighters utility belts, but have since (2002) been integrated into the SCBA units. Effective at 0700 hours on Saturday October 5th 1996, the Main Fire Alarm Office relocated to the new "911 Emergency Communications" center at 1411 W. Madison. The method of dispatching fire and ambulance companies changed forever, as computer aided dispatch replaced the "Sounder" telegraph system. The Englewood Fire Alarm Office also moved into this location on November 2nd. The radio frequencies remain unchanged and are still referred to as Main & Englewood. A new Collapse Rescue Apparatus, 5-2-1, is put into service on October 17th, located in Engine 5's quarters. Designed to respond to many types of collapse incidents, tools are included for building collapse, trench rescue and confined space. On November 3rd 1997, the Advanced Life Support (ALS) Engine program begins. ALS Engine companies equipped with the same emergency medical supplies found on Advanced Life Support Ambulances, and staffed with one Firefighter/Paramedic and one Firefighter/EMT-B, provide pre-hospital care until an ALS Ambulance arrives. Four Engines begin this service, eventually expanding to the current 35, with the goal being to implement the program on all Fire Companies. In June 1, 2000, another innovation, the Basic Life Support (BLS) Program bega. The CFD places 12 BLS Ambulances in service to take some of the workload off of the ALS Ambulances. BLS rigs are staffed with 2-FF/EMT-Bs. Effective January 22, 2001 the Bureaus of Fire Suppression & Rescue and Emergency Medical Services were combined into one, "The Bureau of Operations". This emphasizes the unity of the field units and their working relationship. On November 25, 2002, the Rapid Intervention Team (RIT) program was instituted. This program is designed to assist and/or rescue lost, trapped or injured firefighters. The RIT consists of 1 additional Chief Officer and 1 additional Truck Company, whose only purpose at an incident is the above. 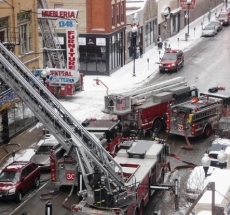 The RIT responds to working fires, building collapses and unusual incidents. June 26, 2003, Thermal Imaging Cameras arrive, made possible by a donation from Jamie Dimon of Bank One, facilitated by the 5-11 Club. Each firehouse received one Thermal Imaging Camera (TIC), with the distribution being one camera to each single engine company, truck company and squad company. October 17, 2003, A 4-11 and EMS Plan 3 at 69 W. Washington- Cook County Building. Six civilians died in a locked stairwell in an unsprinklered building remodeled in the mid 1990's. A federal investigation ensues looking at the cause of the fire, the lack of sprinklers, and the Fire Department response and tactics. The Chicago Fire Department begins an overhaul of Incident Command Procedures with the first revision addressing High Rise and non High Rise Incidents. November 2003, all CFD trucks and squads are fully equipped with Hurst tools. December 8 2003, Engine 63, Truck 16, Ambulance 89, and Field Officer 4-5-8 move into the first of the new generation firehouses at 1440 E 67th St. The new facility includes classrooms and office space for training. March 8, 2004, Engine 100 is taken out of service, and Truck 6 resumes operations out of Engine 13s' quarters at 259 N. Columbus Drive. Squad 1 relocates to E 42s' quarters at 55 W. Illinois St. Engine 100s' quarters located at 6834 S. Harper opened December 31, 1904, closing just short of 100 years in service, also has been the home of Battalion 19, Squad 5 and Ambulance 22. Truck 6 formerly operated out of the old Engine 40s' quarters at 117 N. Franklin from May 7, 1887 until August 1, 1963. March 17, 2004, Engines 26, 34 and 124 join the ALS Engine program bringing the current total to 38 ALS Engines. April 1,2004, Commissioner James Joyce announces retirement as of April 30, 2004. Mayor Daley appoints Cortez Trotter to succeed Joyce as Commissioner.